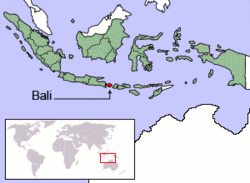 Bali is an Indonesian island positioned in a chain with Java to the west and Lombok to the east. The Balinese people are descendants of a prehistoric race who migrated through mainland Asia to the Indonesian archipelago, presumably first settling around 2500 B.C.E. Around 1011 C.E., Airlanggha, the Balinese Prince, decided to move to East Java where he and his brother, Anak Wungsu, worked to unite both cultures. When Airlanggha died, Bali went through a series of rulers from the middle of the eleventh century until the Europeans arrived. By 1911, the island was under Dutch control. During World War II, Japanese occupied Indonesia, driving out the Dutch administration. In 1949, Indonesia was officially recognized as an independent country. Most of the Balinese people are involved in agriculture, primarily rice cultivation, and double- or triple-cropping is common. Fruits, vegetables and other cash crops are also grown, although in smaller amounts, and a significant number of Balinese are also fishermen. Bali has beautiful beaches and it is one of the best spots in the world for surfing and scuba diving. The island is a popular tourist destination and is known, along with Java, for its highly developed arts, including dance, sculpture, painting, leather and metalworking, and music,especially that played on the gamelan. Its artisans are famous for their batik and ikat cloth and clothing, wooden carvings, stone carvings and silverware. A terrorist bomb exploded there in 2002 and caused civilian casualties. It is a tragedy that Bali became a target of terrorist attack, due to its popularity with Western tourists. Bali, part of the Lesser Sunda Islands, is 95 miles (153 kilometers) long and 69 miles (112 kilometers) wide, and lies about 1.99 miles (3.2 kilometers) east of Java. It lies about eight degrees south of the equator. Its surface is about 3,541.82 mi² (5,700 km²). The highest point of the island is Mount Agung, 10,308 feet (3,148 meters) high, an active volcano that last erupted in March, 1963. Mountains range from the central to the eastern side of the island, with Mount Agung being the easternmost peak. Mount Batur, or what remains of it, is also still active. About 30,000 years ago, Mount Batur experienced a massive catastrophic eruption—one of the largest known volcanic events on Earth. In the south the land descends to form an alluvial plain, watered by shallow rivers, dry in the dry season and overflowing whenever there are periods of heavy rains. The Balinese people are descendants of a prehistoric race who migrated through mainland Asia to the Indonesian archipelago, presumably first settling there around 2500 B.C.E. Evidence such as stone axes and adzes found in Simbiran, a village in northern Bali, has raised speculation that Bali has been inhabited since the Ice Age. An advanced culture, with complicated systems of irrigation and rice production, had been established by the Bronze era (around 300 B.C.E.). After the death of his father around 1011 C.E., Airlanggha, the Balinese Prince, decided to move to East Java. He put his brother, Anak Wungsu, as sovereign of Bali and the two brothers worked to unite both cultures. During this period, there was an exchange of political and artistic ideas as well as the use of Kawi (an old Javanese language) by the aristocracy. When Airlanggha died, Bali went through different rulers from the middle of the eleventh century until the Europeans arrived. For a while, Bali enjoyed independence, but in 1284, Kertanegara, the East Javanese King, subjugated Bali. After Kertanegara was murdered in 1292, Bali was liberated for about half a century. In 1343, the Hindu Majapahit Empire from Eastern Java took power with the general, Gajah Mada. Many changes in Balinese society were brought about, including the introduction of the caste system. During this time, Balinese who couldn’t adapt to the changes fled to remote mountainous areas. Today, their descendants are called Bali Aga or Bali Mula which means the “original Balinese”. This period is known as the last of the Hindu-Javanese empires, but collapsed as Islam expanded through Sumatra and into Java in the sixteenth century. There was a short period of cultural and artistic development when aristocracy, Hindu priests, craftsmen, soldiers and artists came to Bali fleeing the Islamic Mataram Empire in Java, producing what is now considered the Golden Age of Bali’s cultural history. In 1550, Batu Renggong (Dewa Agung, "great god"), became king. At this time, Bali arrived at the pinnacle of its Golden Era. Bali’s decline started when Batu Renggong’s grandson, Di Made Bekung, lost Blambangan, Lombok and Sumbawa. Gusti Agung Maruti, Di Made Bekung’s chief minister, overthrew him and reigned over Bali from 1650 to 1686, when he was killed by Di Made Bekung’s son, Dewa Agung Jambe. Europeans first discovered the island when the Dutch explorer Cornelis de Houtman arrived in 1597, though a Portuguese ship had foundered off the coast of Bukit as early as 1585. The Dutch did not show real interest in colonizing Bali until the 1800s, after they had taken control of large areas of Indonesia throughout the 1700s. In 1846, the Dutch administration sent troops into northern Bali where a series of colonial wars ensued. The Dutch forces, supported by the Sasak people of Lombok, defeated the Balinese rulers in 1894 and by 1911 the entire island was under Dutch control. These wars were so fierce (with the entire royal court of the Raja, women and children plunged into battle, armed with kris and spears, killing each other on the battlefield rather than be taken captive) that the Dutch governors afterwards exercised a lenient control, showing great respect for and protecting the local religion and culture. The Japanese occupied Indonesia from 1942 to 1945, driving out the Dutch administration. After World War II, the Dutch attempted to reclaim their former colonies, but Indonesia claimed independence on August 17, 1945, with Sukarno as its first President. After much criticism from the international community, the Dutch abandoned their attempts to regain Indonesia, and in 1949, Indonesia was officially recognized as an independent country. While the Balinese government is in charge of the schools, clinics, hospitals, and roads, the other aspects of life are left to two traditional committees within the communities: Subak and Banjar. The production of rice and the organization of the irrigation systems are administered by the Subak. Anyone who owns a rice padi (sawah) is required to become a member of their community Subak, which in turn, guarantees that each member receives a fair distribution of irrigation water. Each village has a Banjar which organizes all village festivals, marriage ceremonies and cremations. When he marries, every male is required to join a Banjar. Most of the Balinese people are involved in agriculture, primarily rice cultivation. Other crops such as fruits, vegetables and other cash crops are also grown, although in smaller amounts. A significant number of Balinese are also fishermen. Bali is famous for its artisans who produce batik and ikat cloth and clothing, wooden carvings, stone carvings and silverware. Balinese and Indonesian are the most widely spoken languages in Bali, and many Balinese people are bilingual or even trilingual. English is a common third language, owing to the island's large tourism industry. The Balinese language is a rich and diverse language reflecting the population. In the past, the language has been heavily influenced by the Balinese caste system, but this is becoming less and less pronounced. The 2002 Bali bombing occurred on October 12, 2002, in the tourist district of Kuta. The attack was the deadliest act of terrorism in the history of Indonesia, killing 202 people, 164 of whom were foreign nationals (including 88 Australians), and 38 Indonesian citizens. A further 209 were injured. The attack involved the detonation of three bombs: a backpack-mounted device carried by a suicide bomber; a large car bomb, both of which were detonated in or near popular nightclubs in Kuta; and a third much smaller device detonated outside the United States consulate in Denpasar, causing only minor damage. Various members of Jemaah Islamiyah, a violent Islamist group, were convicted in relation to the bombings, including three individuals who were sentenced to death. Abu Bakar Bashir, the alleged spiritual leader of Jemaah Islamiyah, was found guilty of conspiracy, and sentenced to two and a half years imprisonment. International tourism started in the 1920s. The main tourist locations are the town of Kuta (along with its accompanying beach), Sanur, Jimbaran, Seminyak and the newer development of Nusa Dua. 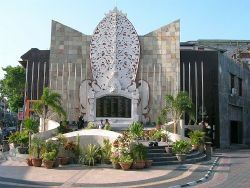 The Ngurah Rai International Airport is located near Jimbaran, on the isthmus joining the southernmost part of the island to the main part of the island. There are no railway lines on the island. There are major coastal roads as well as roads that cross the island, mainly in a north-south manner. Due to the slope of the mountainous terrain in the island's center, the roads tend to follow the crests of the ridges across the mountains. Bali's beaches are famous worldwide. The island is surrounded by coral reefs. Beaches in the south tend to have white sand while those in the north have black sand. The beach town of Padangbai in the north east has both: the main beach and the secret beach have white sand and the south beach and the blue lagoon have much darker sand. Bali's arts and crafts are popular with tourists. Balinese dance is highly developed, (much more so than European Ballet) and considered by many to be one of the world's finest artistic traditions. "Pendet","Legong" and "Baris" are some of the better-known examples. Tanah Lot - Southwest Bali, Tabanan regency. Uluwatu - South Bali on Bukit Badung. Pura Jayaprana - Northwest Bali. Pura Rambut Siwi - Southwest Bali, (6.21 miles from Medewi). Pura Besakih - Besakih, Karangasem regency Northeast Bali. Pura Luhur Batukau - Tabanan, South Bali. Pura Yeh Gangga - near Mengwi, Tabanan. Pura Ulun Danu Batur - near Batur village. Pura Ulun Danu Bratan - near Bedugul. Pura Gunung Kawi - Set in a ravine in Tampaksiring. Brahma Vihara Ashrama Buddhist Monastery - near Lovina. Goa Gajah or Elephant Cave - near Teges, Gianyar regency. Goa Lawah or Bat Cave - Klungkung regency. Goa Karang Sari - on Nusa Penida Island, Southeast of Bali. Puri Semara Pura - Klungkung. Taman Ujung Water Palace - near Amlapura, East Bali. Puri Agung Kanginan - Karangasem, Amlapura. Tirtha Gangga Royal Bathing Pools - near Amlapura, Karangasem regency. Asak - near Amlapura, East Bali. Bungaya - near Amlapura, East Bali. Sawan - near Singaraja, North Central Bali. Tenganan - A Bali Aga village. Trunyan - on the shores of Lake Batur, Northeast Bali. Lake Batur - Mt. Batur, Bangli regency. Lake Bratan - Mt. Catur near Bedugul. Lakes Buyan and Tamblingan - Mt. Lesong in Buleleng province. Bali’s population is estimated at over 3,000,000 people. Most of Bali’s population lives in tight village communities with big extended families. Denpasar, the capital of Bali; and a city in the north, Singaraja, are the largest towns. Around 500 C.E., the main religion in Bali was Buddhism. This is confirmed by the Chinese scholar Yi-Tsing who reported visiting a Buddhist country called Bali during this trip to India in 670 C.E. As a result of the fusing of Hindu, Javanese, and Balinese cultures after 1011 C.E., the majority of Bali’s population adheres to Hinduism. “The Balinese worship the Hindu trinity Brahma, Shiva and Vishnu, who are seen as manifestations of the Supreme God Sanghyang Widhi. Other Indian gods like Ganesha (the elephant-headd god) also appear, but more commonly, one will see shrines to the many gods and spirits that are uniquely Balinese”. Magic and the power of spirits is very much a part of Balinese religion. ↑ Bali: Island of Peace Bali Discovery, December 30, 2011. Retrieved May 31, 2016. ↑ 2.0 2.1 2.2 Bali, Indonesia-tourism. Retrieved May 31, 2016. ↑ 3.0 3.1 3.2 3.3 3.4 3.5 Culture, Bali Plus. Retrieved May 31, 2016. ↑ "Bashir's release a cause of great pain" The Age newspaper, June 15, 2006. Retrieved May 31, 2016. This page was last modified on 31 May 2016, at 15:56.